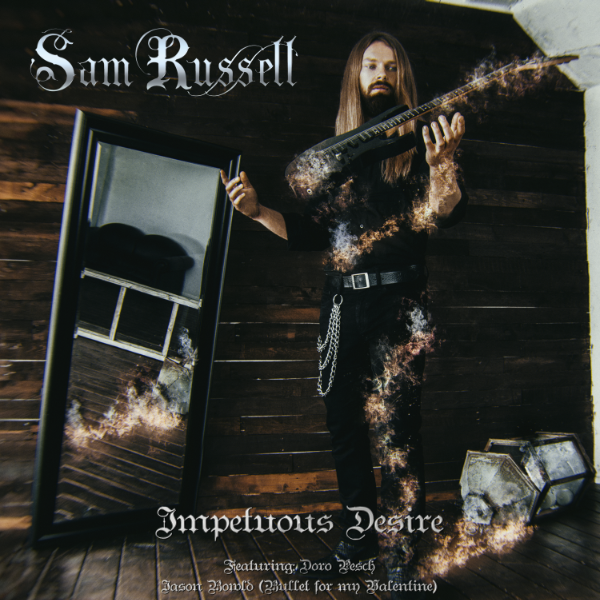 Virtuoso guitarist Sam Russell releases his first heavy metal record, Impetuous Desire (Danneskjöld Records), to be released October 2017. The record features all original material and displays the young shredders first venture into songwriting, taking impressive lead guitar playing and seamlessly blending it with catchy, original songwriting. Impetuous Desire was written over a period of 2-3 years. The entire experience was a crash course in song writing for Sam, learning how to write lyrics, structure and arrange songs from scratch. While writing the record, Sam knew he wanted real musicians rather than sampled instruments. This led to him contacting Jason Bowld (Bullet for My Valentine) to do the drum parts. After getting the guitars recorded, the other musicians involved started doing there parts. Jacqueline Philips of the Brooke Ensemble and BBC Orchestra was brought in to record the cello parts on Longing. “Jacqueline is a world class cellist. She recorded her parts in about 7 minutes, giving us three perfect play throughs of the track. We weren’t really sure how to decide which recording to use, they were all great”. …”Impetuous Desire” is an incredibly strong effort that will absolutely please fans of symphonic and melodic metal groups like Xandria, Sonata Arctica, Delain, and Axel Rudi Pell. …a very song-oriented, tightly-composed album with some incredible songwriting values to go with the amazing musicianship all around. Relying solely on the strength of his songwriting, Sam reached to various singers about performing on his record. “I figured what the hell,” Sam recollects, “the songs are good. If you don’t ask you don’t get!” After getting a reply from Doro Pesch’ manager stating Doro liked the song and was interested, things quickly moved forwards. “It was crazy getting a reply back from someone who’s shows you went to, who you saw play at festivals, and you looked up to as a hero; to get to work with them.” A couple of months later Sam was in Rock City Studios in Germany with Doro and her Manager, and the vocals to the song Leigh Woods were recorded. Firmly believing that a record is more than just music, Sam wanted to create not just a record, but a piece of art. “I wanted to create some special, so I contacted an artist I liked called Helen Hebenton at Uncanny Designs.” Helen was commissioned to create a piece of art for each song, showing the story behind each song. “I loved what she created, I felt it added more depth to the record” Sam remembers. “Impetuous Desire” is a beautiful, well produced album which shows all talent.